Ride The Breezeway! Atwood - Ellsworth - East Jordan - Boyne Falls ... A Northern Michigan Scenic Adventure! Special thanks to Bob and Eleanor DeYoung for producing this video! 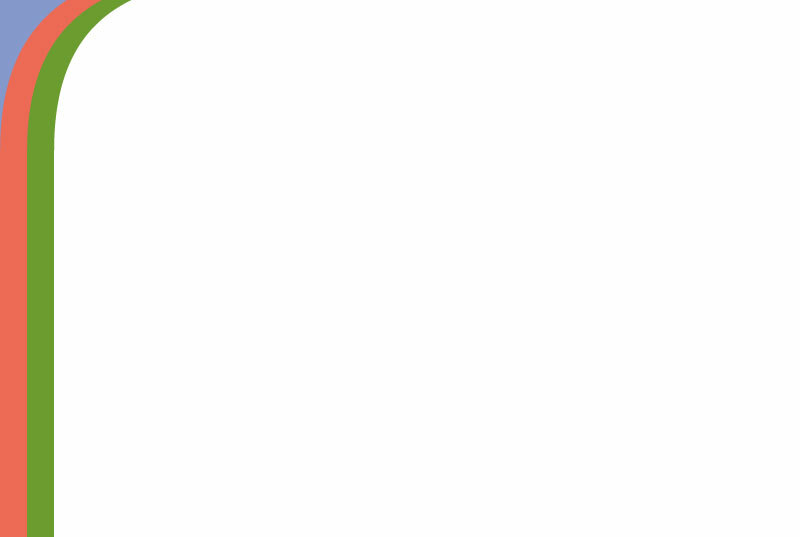 LIKE The Breezeway on Facebook! LANSING, Mich. –“The Breezeway,” a 26-mile business corridor that stretches from Atwood to Boyne Falls, will soon be activated through a new crowdfunding campaign , the Michigan Economic Development Corporation and Northern Lakes Economic Alliance announced today. The campaign is being offered through Michigan-based crowdfunding platform Patronicity. If the campaign reaches its crowdfunding goal of $5,000 by October 10, the project will win a matching grant with funds made possible by MEDC’s Public Spaces Community Places program. For project details and to donate, please visit: Patronicity.com/greenlight. The "Breezeway" - a rural ride along C-48 from Atwood (U.S. 31) through Ellsworth & East Jordan, and ending in Boyne Falls (U.S. 131) - boasts scenic overlooks, great motorcycle & bicycle rides, recreational amenities galore, working farms & orchards, artist galleries & studios, resale shops, lodging facilities (cottages, campgrounds, B&Bs, motels, and a resort), retail and service businesses with superb customer service, and an epicurean's selection of dining choices along the route. We now have almost 200 "Breezeway Places" in our database!! 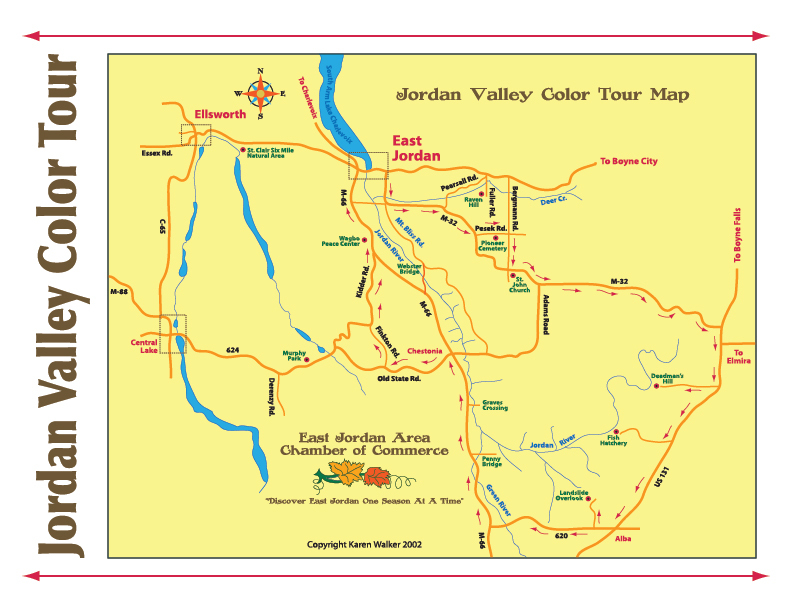 Click on Location for maps; click on For Visitors to search for detailed information. 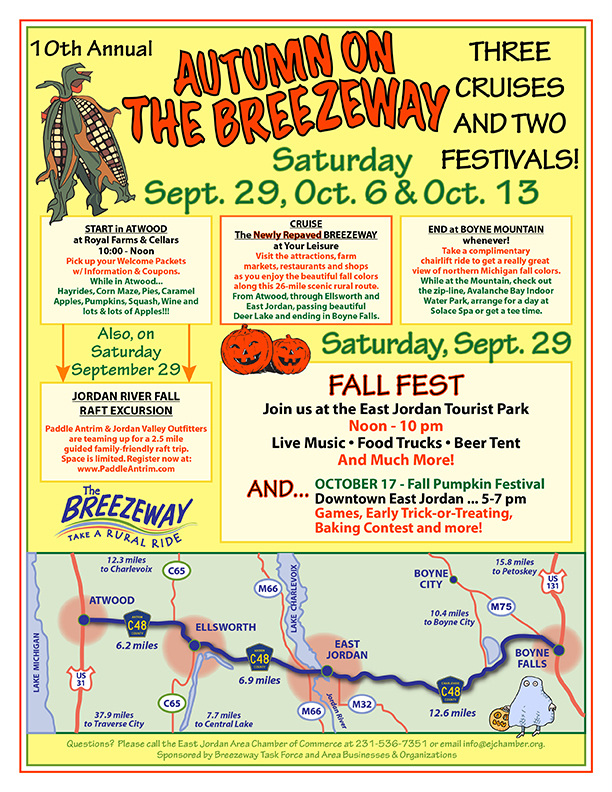 Want to be kept abreast of Breezeway news, information & upcoming events? Sign up below! Need Help Starting a New Business Along The Breezeway? Let’s say you are an artist or have an invention or a service that you would like to convert to real commerce, but have never really known where to turn for support. Because you live on The Breezeway, help is available to you. We offer assistance with business plans, financing options and marketing. This energy is at the core of our Breezeway goals. Just call the E.J. Chamber at 536-7351 or the B.C. Chamber at 582-6222 and ask. Let us help make your Breezeway dreams come true! The Official "Ride the Breezeway" Treasure Chest is Now Available! 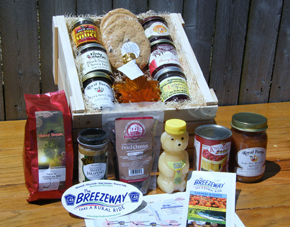 Enjoy 14 exceptional food products from Northern Michigan's Breezeway businesses, carefully packed in to a hand crafted two–layer gift crate. This re-useable all wood crate is made right here on the Breezeway by the folks at Mi Farm Market in Ellsworth, MI! Visit MiFarmMarket.com for product details or to order one of these true Northern Michigan jewels.